Wow, I can't believe it's already March! We're just about to reach the first day of spring and the Easter holiday is not too far after that. This is an exciting time of year for us, when we can finally get out of the winter rut, and look forward to milder weather with more time spent outdoors. 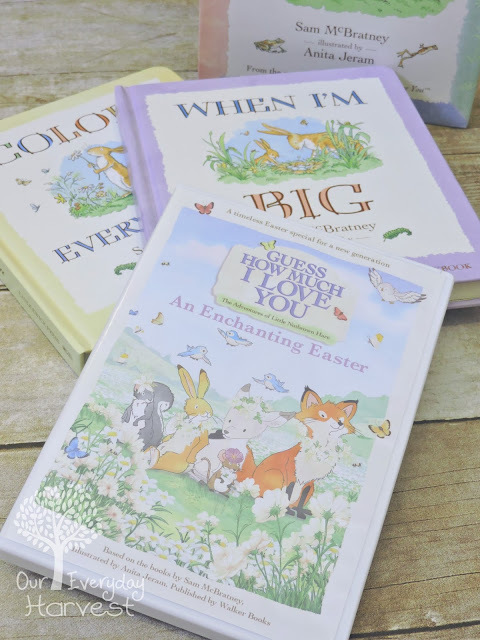 One book series that we particularly enjoy reading around this time of year is Guess How Much I Love You. With fun characters like Little Nutbrown Hare, and his woodland friends displayed on pages with beautiful pastel watercolors, it really gets us in the mood for the spring season. A few years ago, the story of Little Nutbrown Hare and his father, Big Nutbrown Hare, were also brought to life in an animated series inspired by the books. An Enchanting Easter is the latest installment in this beautiful animated collection, and has recently been released just in time to celebrate both Easter and the upcoming spring season. 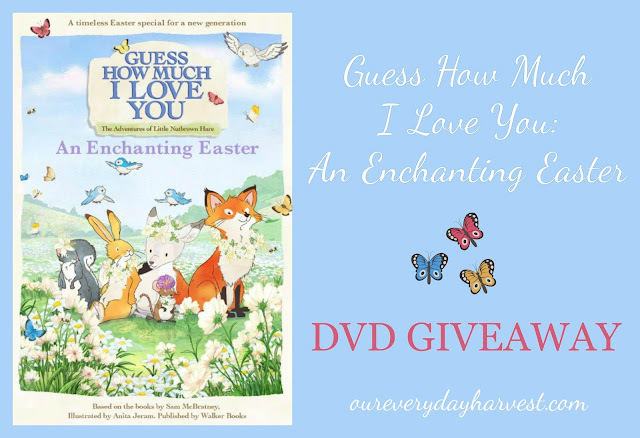 In Guess How Much I Love You: An Enchanting Easter, Little Nutbrown is outside playing when one night he catches a beautiful white fawn. As the fawn runs off into the moonlight, Little Nutbrown Hare is amazed by her beauty and is eager to tell the rest of his friends, Little Field Mouse, Little Grey Squirrel, and Little Redwood Fox. Unfortunately, they don't believe him. 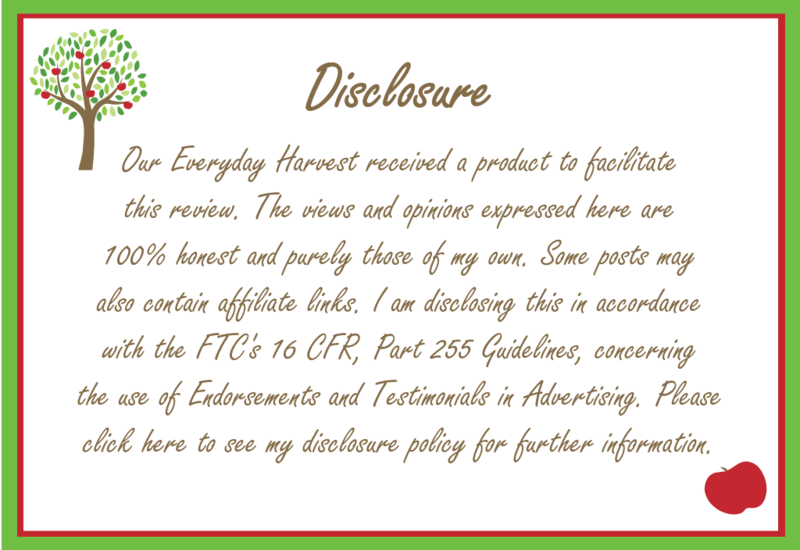 A sequence of events happen that only leads to Nutbrown Hare's friends growing more and more skeptical of his claim. He wants to prove what he saw once and for all, so he and his friends venture off into the woody woods and across the streamy streams to find the white fawn. While back at home Big Nutbrown Hare is left in charge of watching Blue Bird's eggs, while she looks for more twigs for her nest. What happens next is a fun surprise! We love the beautiful animation in all of the Guess How Much I Love You cartoons, and this new one is no exception. My son and I enjoy snuggling up on the couch to watch this. There's something simple, yet magical about the story. With plenty of grassy fields and blue skies, this short animated film does a spectacular job at celebrating the beauty of nature and springtime adventures with friends, while also making new ones along the way. Guess How Much I Love You: An Enchanting Easter would make a beautiful gift and addition to any child's Easter basket. You can find it on Amazon and other DVD retailers. You can also enter for your chance to win one, right here. One winner will be chosen. To enter, please follow the giveaway prompts, below.